Peter Watt's life experiences have included time as a soldier, articled clerk to a solicitor, prawn trawler deckhand, builder's labourer, pipe layer, real estate salesman, private investigator, police sergeant and adviser to the Royal Papua New Guinea Constabulary. He has lived and worked with Aborigines, Islanders, Vietnamese and Papua New Guineans. He speaks, reads and writes Vietnamese and Pidgin - and has a reasonable grasp of the English language. He currently lives in Maclean, on the Clarence River in Northern NSW. Good friends, fine food, fishing and the vast open spaces of outback Queensland are his main interests in life. He also enjoys SCUBA diving, military history, crosswords (but not the cryptic kind) and teaching. He is a member of the Australian Institute of Management, the Australian Institute of Training and Development and the Australian Society of Authors. He holds a Bachelor of Arts Degree (University of Tasmania), Post Graduate Diploma of Training & Development (University of New England) and an Associate Diploma of Justice Administration (Sturt University). He currently lives in Maclean...where he spends 6 months of the year working as a volunteer bush fire fighter with the NSW Rural Fire Service. 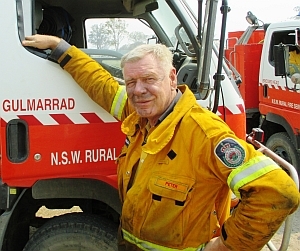 In the past Peter has also been a volunteer training officer on the Murray River with the Volunteer Rescue Association, and also a volunteer ambulance emergency driver with the Queensland Ambulance Service.